The heart acts as a pump to distribute blood to the entire body with each heartbeat. The contraction and relaxation of the heart forms a cardiac cycle. 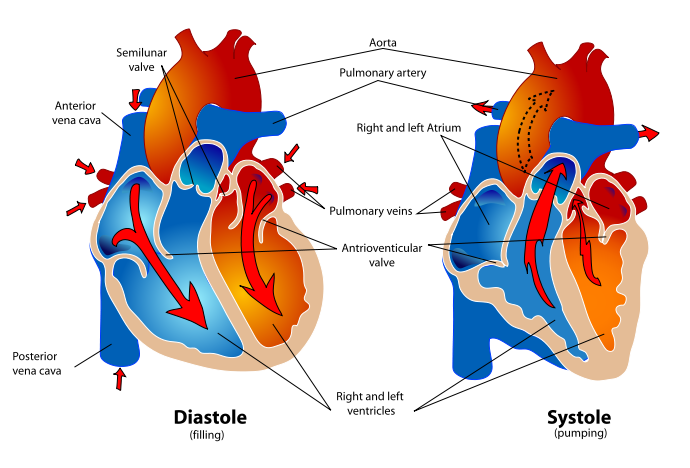 The relaxation phase of the cardiac cycle is known as Diastole and the contracted phase of the cycle is called as Systole. We need to understand the structure of the heart and the cardiac cycle before understanding the terms diastole and systole. Human heart is a contractile organ that is composed of four chambers. The two upper chambers are called atria (atrium= singular) and the two lower chambers are known as ventricles (ventricle = singular). During the cardiac cycle, electrical impulse is generated in the walls of the upper chambers of the heart and spreads through the muscle fibres across the chambers. The upper chambers contract a few seconds earlier and push the blood to the lower chambers which are in the relaxed phase to receive the blood. Once blood enters the ventricles, atria relax and the ventricle walls begin to contract to pump the blood into the major arteries through which the blood reaches all the organs of the body. This is followed by relaxation phase of the whole heart during which the blood gets filled in the upper chambers. Systole is the phase in the cardiac cycle when the ventricles contract to pump the blood into the arteries. The maximum pressure exerted by the blood on the arterial wall during this phase is called as Systolic pressure. The words ‘systolic’ is derived from the Greek word ‘systole’ which means drawing in together. This is usually represented by the upper number in the blood pressure reading. The ventricles are in a contracted state in this phase. The normal systolic pressure is around 120 mmHg and normal range is between 95-120 mm Hg. Systolic pressure increases with age as the arterial walls harden due to arteriosclerosis. When Systolic pressure goes above 140 mm Hg it is considered as hypertension or high blood pressure which warrants medical attention. The systolic blood pressure varies according to the age, gender, circadian rhythm, stress, physical workout or disease process. Children and athletes have a lower blood pressure whereas aged persons have a higher blood pressure. Diastole is the relaxed phase of the cardiac cycle when the whole heart is relaxed and the blood pours into the upper chambers of the heart. During this time also there is blood in the arteries. The minimum pressure exerted by the blood on the walls of the arteries is known as Diastolic pressure. It is denoted by the mower number of the blood pressure reading. The word ‘diastolic’ is derived from the Greek word ‘diastole’ which means pulling apart. The atria and the ventricles are in a relaxed phase. The normal diastolic pressure is 80 mm Hg. 60-80 mm Hg is the normal range of diastolic blood pressure. When diastolic blood pressure goes above 90 mm Hg it is considered as high blood pressure and should be treated medically. The systolic and diastolic phases of the cardiac cycle are measured in the form of blood pressure using a sphygmomanometer (manual or electronic). The blood pressure is normally measures at the elbow at the level of brachial artery. In certain conditions it can be measured at the wrist (radial artery), back of knee (popliteal artery) or front of ankle (dorsalis pedis artery). The blood pressure is one of the vital signs seen during physical examination of any patient and reflects the status of the heart and the circulatory system in general. An increased blood pressure increases the risk of heart attack and stroke. Maitreyi Naigaonkar. "Difference Between Systolic and Diastolic." DifferenceBetween.net. May 28, 2015 < http://www.differencebetween.net/science/health/difference-between-systolic-and-diastolic/ >. While I find your facts very interesting, I think it would be better to send the Difference Between email out twice a month or once a month or once a week. There’s just too much information to digest and go through on a daily basis with all the other email one gets. Otherwise, I’ll need to unsubscribe.